It became something of a joke in the British army that when Kate Adie arrived on the scene, the soldiers knew they were in trouble. The BBC's chief news correspondent became one of the best-known faces on television for her reporting from the major wars of recent years. They include the Gulf War, the conflicts in the former Yugoslavia, Albania, Rwanda, China and Sierra Leone. It cannot have occurred to the 23-year-old from Sunderland, with her degree in Scandinavian Studies, that this was where she was heading when she joined the BBC in 1968 as a studio technician in local radio. Even when she began making programmes as a producer, she started well away from news, in farming and arts programmes for Radio Bristol. She moved on to direct outside television broadcasts for sport and religious programmes. She began work as a journalist in regional TV in Plymouth, Southampton and Brighton, joining BBC TV News in London in 1979. Although she covered some overseas stories, she also spent two years as a court correspondent. Her coverage of the 1980 siege of the Iranian embassy changed all that. It brought her to prominence as one of the few women reporting difficult and dangerous stories at the time. She herself describes the turn her career took as largely accidental. "I never desired to go into war zones," she says. "I never had any thought about it. It sort of just happened as part of the job." 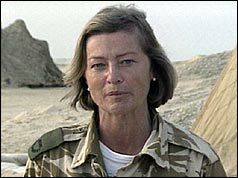 Kate Adie became the BBC's chief news correspondent in 1989. She again came to the fore when covering the brutal suppression of the student uprising in Tiananmen Square. For this, as well as other major stories, she has won an impressive array of awards and a clutch of honorary degrees. Her honours include three RTS awards, the Bafta Richard Dimbleby Award, and the Broadcasting Press Guild's Award for Outstanding Contribution to Broadcasting. She was awarded an OBE in 1993. Kate Adie presents From Our Own Correspondent on BBC Radio 4 and continues to make many other programmes for the corporation. I don't find an advantage or disadvantage in being a woman when reporting. What little advantages there might be in some instances is cancelled out by the basic lack of lavatories round the world for women. It may seem trivial but when you're in a frontline unit with 2,000 men in the desert in Saudi Arabia which is flat and has no sand dunes, no trees and no bushes, there were a number of practical difficulties to say the least.